Here I go again putting my Work of Art #134114 stamp set to work. As a tribute to the end of summer and my favorite fruit I made a yummy thank you card. 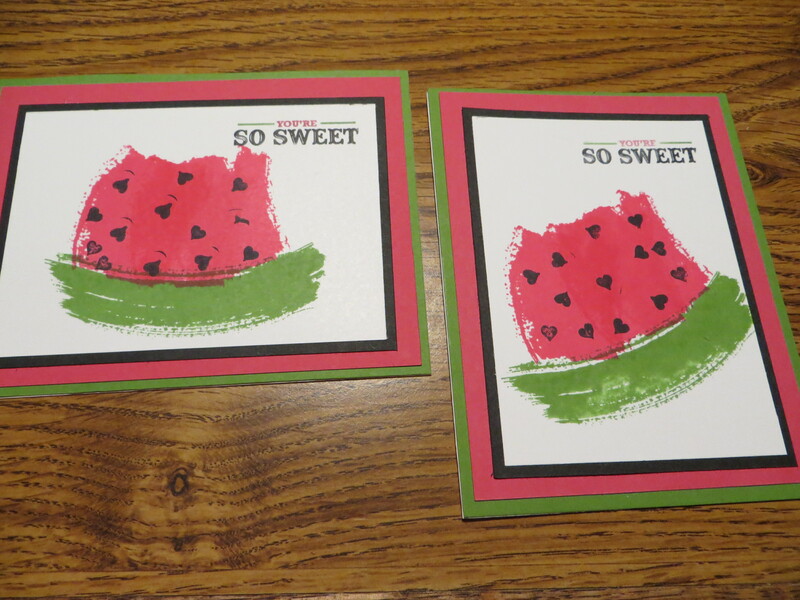 For the watermelon seeds, I used the heart from the Bitty Banner stamp set. 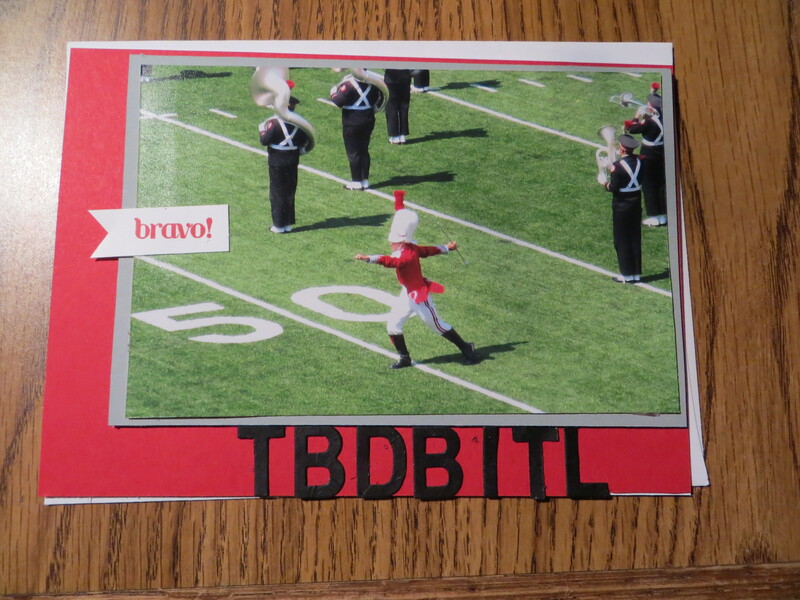 The Ohio State University Marching Band is truly THE BEST DAMN BAND IN THE LAND and today’s post is the card I made my son’s friend, Jacob for making the TBDBITL in the X row (trumpets). Jacob worked hard all summer practicing until he was perfect and selected as one of the 225 marching Buckeyes. Bravo Jacob! To make this card, I repurposed a card that I received from a friend and added Stampin Up cardstock and the TBDBITL letters cut from the Little Letters Thinlits #133730 and a handcut bravo flag using the A Dozen Thoughts #131059 stampset. Hopefully the OSU Buckeyes and the TBDBITL have a great year! Today’s post is a 2fer card. Same design 2 looks. 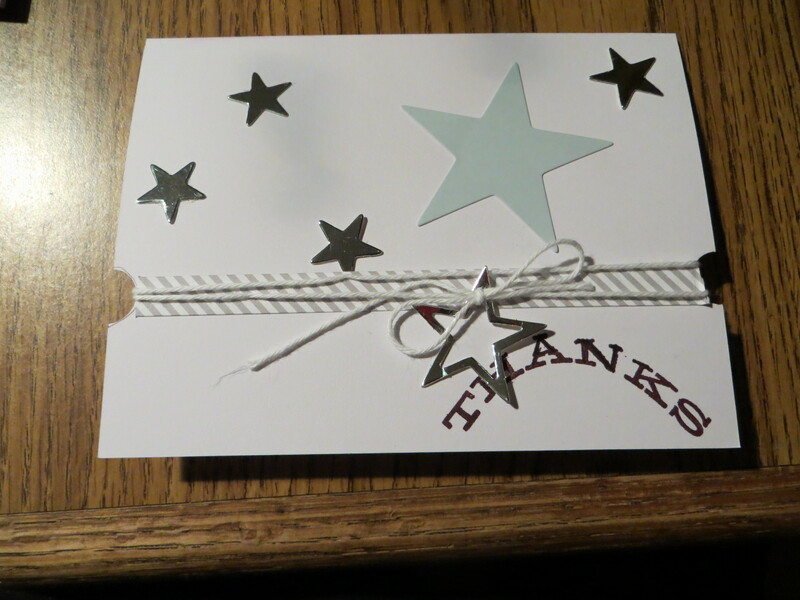 For this card, I used the now retired Fresh Prints paper stack for both panels on both cards. 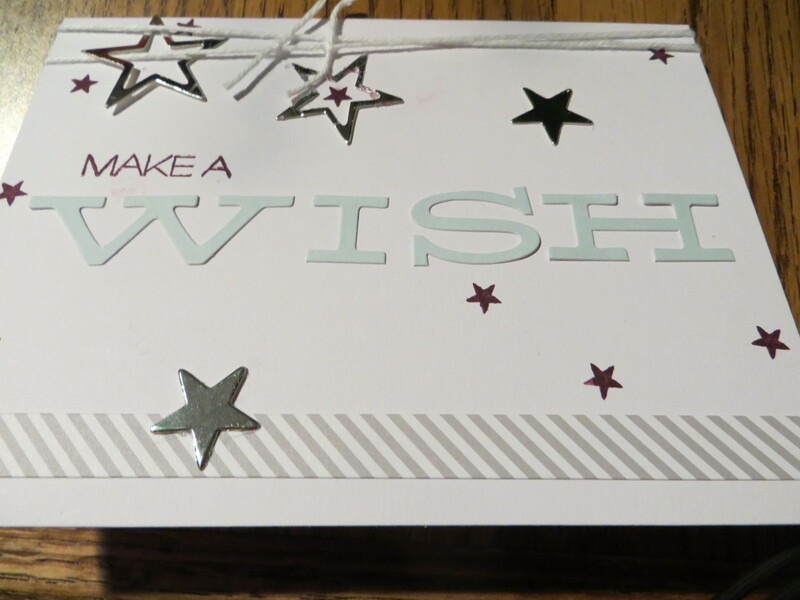 The gatefold card was created using the Stampin Up envelope punch board #133774. 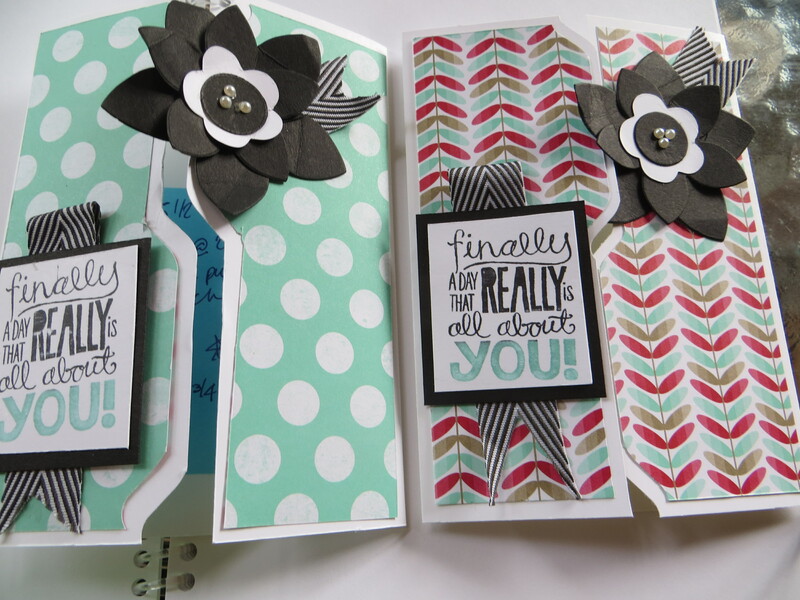 I added a black flower by stacking several layers from the flower Frenzy Die #133728. 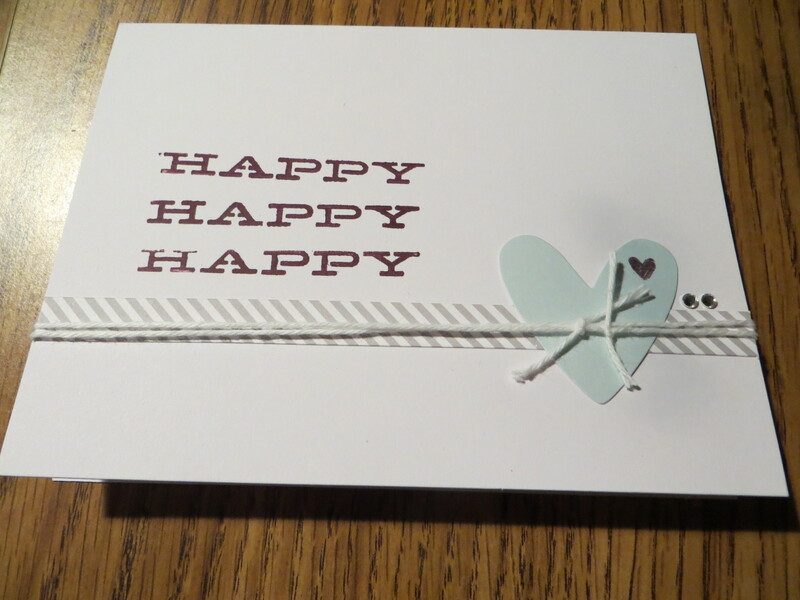 The sentiment is from the Really Good Greetings #130333 stamp set and is placed on top of a basic black piece for Chevron Ribbon #130010. I truly love this color combination and can attest that black really works with everything. 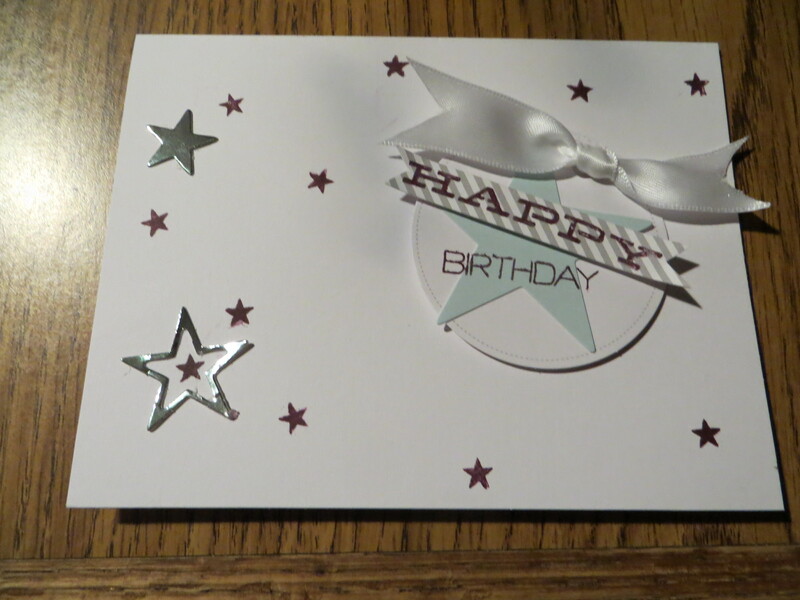 I have really been working with the Stampin Up Maritme DSP #133696 lately and I must say when I saw this paper in the DSP pack I thought it was way too busy to use on a card but boyI was I wrong! I just cut the paper into sections. The red card base helps “quiet” down and balance the busy background. I added a sentiment from a retired stamp set ( I can’t remember the name) and added it to a hand cut banner with some of the Coastal Cabana Thick Baker’s Twine #135638 to finish the fun card! 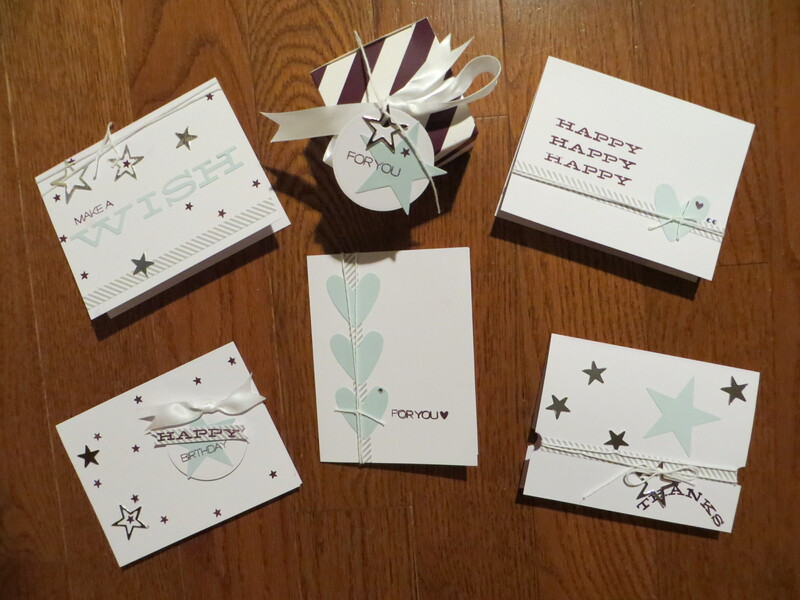 Today’s post is some of what I made using the July 2014 Stampin Up Paper Pumpkin kit. Each month a Paper Pumpkin kit comes to you and is a fully designed project kit arrives in an adorable box filled with stamps, ink and paper – everything cut and ready to go. Just think of it as creativity in a box! All you need are some scissors, adhesive and your paper pumpkin kit. Below are the close ups of some of my finished cards. I still have lots of stuff left over so I plan to combine it with other Stampin Up products to create some other cards.So stay tuned! Every week Stampin Up introduces items that are on sale for 1week only. Check out the latest batch of Stampin Up deals. Discounted items for this week end on Sept1st. If you see something you want to order use the sign in or create a new account to place your online order. Summer is winding down and today I am posting a tribute to summer card. 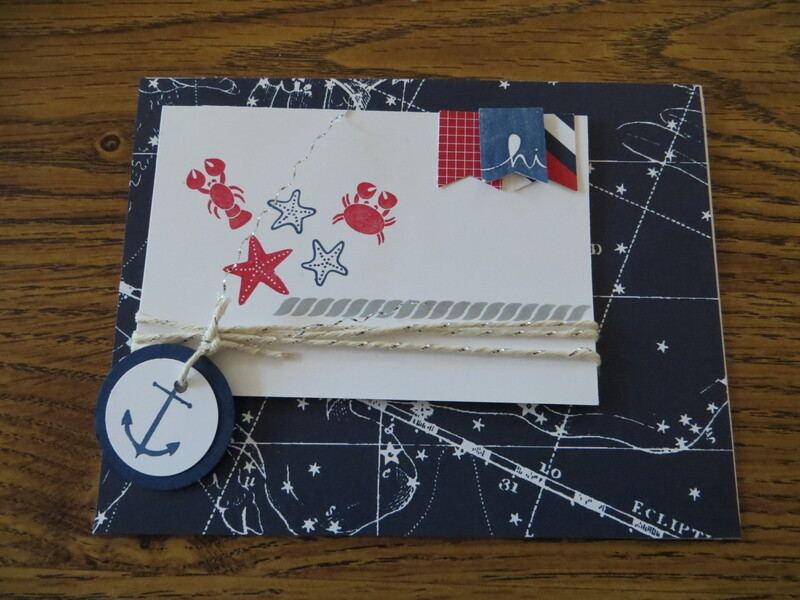 I absolutely love the Stampin Up Maritime DSP #133696 which I used for the background paper and the cute banner flags punched from the Banner punch #133519 in the Stampin Up annual catalog. the “hi” banner was stamped using the coordinating Banner Banter #134060. 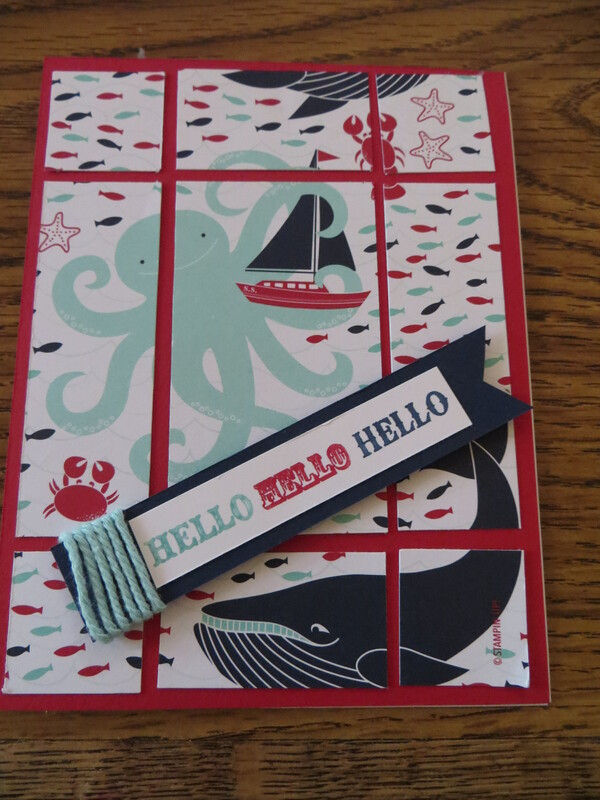 The sea life stamped images and the anchor are from the Sea Street #133988 stamp set. 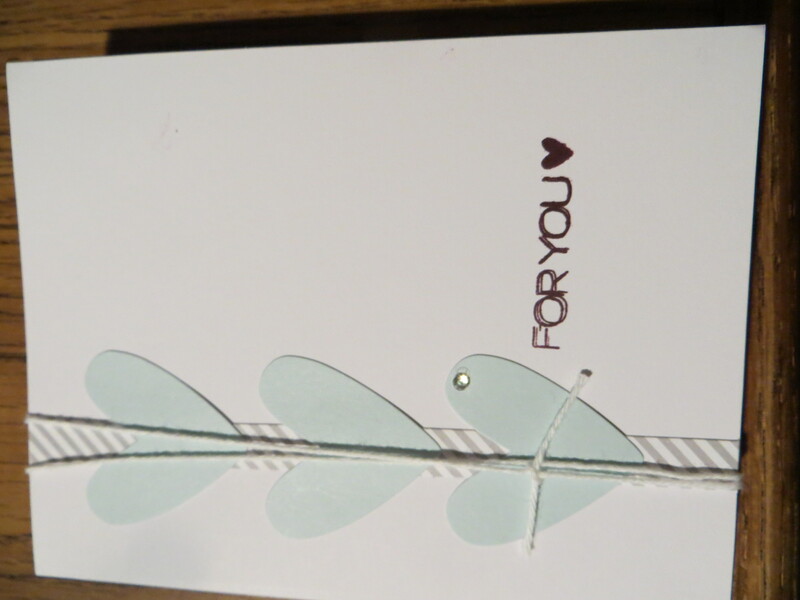 I wrapped the card with the gold Bakers twine #132975. I am sad that summers over but looking forward to the tastes of fall and all the exciting new products coming in the Stampin Up holiday catalog.